The window tinting industry’s first and only absorbent rope braid used for absorbing water running down behind the dash of a vehicle while installing film helping to protect the electronics and other parts from water damage. This braided absorbent rope is tucked between the bottom of the windshield and the dashboard to stop and soak up the water running down behind the dash and causing issues with electronics. 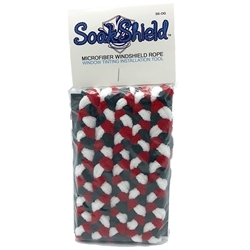 The Original SoakShield rope is 5-6' long depending on stretching it out during installation. Works great for average coupe, sedan or compact SUV.